We are specialist on bolted assemblies, so our customers use to ask technical questions about our products and their applications. One of the most demanded topics is how to ensure precision in a bolted assembly in a production line. That’s why from TORMETAL we offer complete assembly solutions thanks to a wide range of electronic transducer torque controlled tools, giving to the users a state-of-the-art solution with the highest precision at a very competitive cost. Our range gives you the ability to control torques between 0,8 and 2.000 Nm in the standard range, and up to 80.000 Nm with special tools. Higher quality in the manufactured product. Different torques in a single process, with a single tool. One single tool for different processes. TORMETAL has got specialized technical staff trained on this tool range. 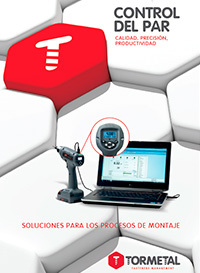 We can organize a personal demo and we’ll help you on the selection of the optimal tool. The quality and the warranty of the our electronic assembly tools, comes from the manufacturer, Ingersoll Rand®, a world leader in this product range.